Sad Shad Weighted Hooks are the perfect component of terminal tackle. These custom hooks have the same sharp EWG 8/0 hook, but with lead weight in sizes 1/2, 3/4, and 1 ounce to get your bait towhere the fish are! Benefits include shorter drifts because your bait will sink faster into that eddy or rip that the fish are holding in. Fish out of casting range? High winds? No problem, add as little as 1/2 ounce to counter act wind, or 1 ounce and cast your bait beyond the fish! Weighted hooks feature tear drop design to act as a keel and keep bait upright. 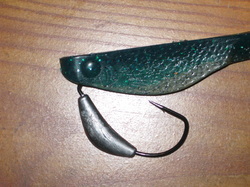 The Sad Shad's large hook slot won't hinder even the one ounce of weight from having a large bite on the hook set! See rigging below. Nose hook bait as normal, then carefully slide hook back out. 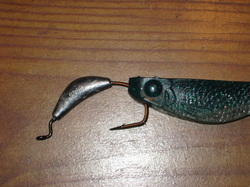 Tip, slight upward pressure on the hooks opposite side will keep the barb from tearing plastic. Slide hook eyelet back into the bait from the chin side out through the hole you just made. 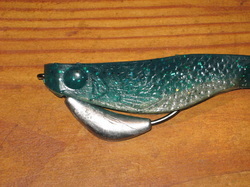 Finish rigging hook by hooking up through hook slot and protruding out the back of bait. Some prefer to leave point exposed, others slightly bury point into the plastic. Make sure the bait is straight . 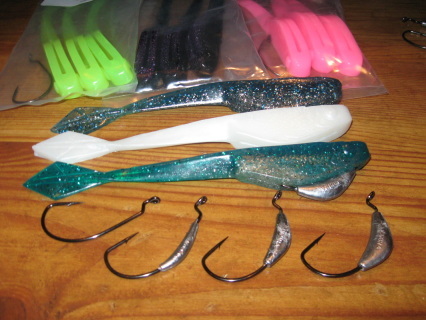 Tie rigged bait to your line and go catch some fish!!!! Note: This form of rigging requires pre-rigging the bait, then tying bait to your line. This is good practice no matter, always remember to check your knots and line, retying can be the difference of that fish of a life time or heart break!